Dreher 100% carbon sculling oars are designed for optimum performance. 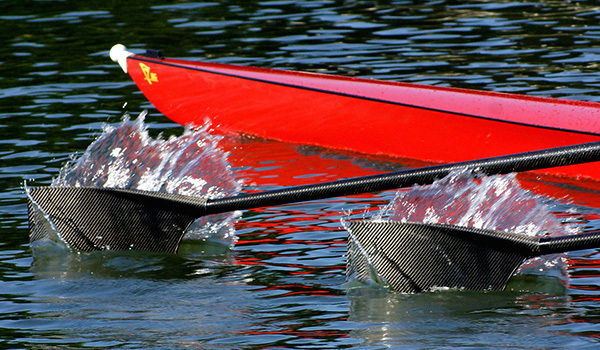 Our oars are lightweight, rigid, and built to last. Dreher is the only oar manufacturer in the World that autoclaves their shafts and bilaterally compression molds the blades so that the blades come out of the mold with a Class A finish, not requiring priming or painting to cover up manufacturing defects. Dreher’s High-Performance Sculls are produced with the elite oarsman in mind. These sculls are constructed with a mix high-modulus carbon fiber to produce a lighter weight oar without sacrificing Dreher’s meticulous by used of a blend of twill and standard modulus carbon to maintain high durability standards. These oars come with a variety of blade designs to suit the needs of the specific athlete. Dreher’s Alpha sculls are the lightest weight design and are constructed with a mix twill on the blade and a lighter weight shaft to provide a favorable balance point. When designed, the blade and shaft were unique to this scull type. Initially, the tool-free-adjustment exclusively allowed scullers to change the gearing on-the-water. After the first year, over, this feature was offered as an option on all newly manufactured adjustable length sculls. Dreher’s line of adjustable sculls offers many of the same great design features of our High-Performance Sculls but at a more affordable price point. This line of Dreher oars was developed with the entry-level sculler, the club oarsman, and the pre-elite sculler in mind. Featuring adjustable length, three different blade shapes (Apex, Apex-R, and BB2198), three levels of shaft stiffness, and three handle sizes. Dreher Aerodynamic oars draw on 25+ years of oar design and carbon manufacturing experience to produce exceptional high-performance oars. Our Aerodynamic oars represent a major departure from previous designs by utilizing an elliptical aerodynamic shaft and hydrodynamic blade. This line of Dreher products has an optimized oar shaft and blade shape to increase efficiency through the air and water. Dreher oars also cater to the Recreational Touring oarsman, Open-Water enthusiast, and Junior Sculler. This line of oars includes our adjustable length oars with a variety of blade choices and stiffness. Designed with the recreational and junior oarsman in mind, these oars can help provide many years of enjoyable sculling. Our Dreher Fixed Length Sculls offer clubs a truly cost-effective way to get scullers on the water. Our Fixed Length Sculls are straight-forward and simple with a fixed length and no-optional features. Fantastic for entry-level athletes and sculling schools. Since these sculls do not have any options, click the link to go directly to our the store.